A new door gives your facade a facelift, while improving security and energy efficiency. Plus, recent data suggests the replacement all but pays for itself upon resale. So what are you waiting for? When Remodeling magazine last published its annual Cost vs. Value Report, many were surprised to learn that, of all the many different home improvements one might undertake, front door replacement offers the greatest return on investment. Upon resale, homeowners recoup a whopping 97 percent of the project cost. We already knew what a difference replacing the entry door could make for a home’s curb appeal. Now we know that the upgrade virtually pays for itself. As the first and last thing a houseguest sees on his visit—and as a familiar, inevitable part of the homeowner’s daily life—entry doors play a pivotal role in design. Therefore, for a job of such modest proportions, front door replacement delivers outsized benefits. 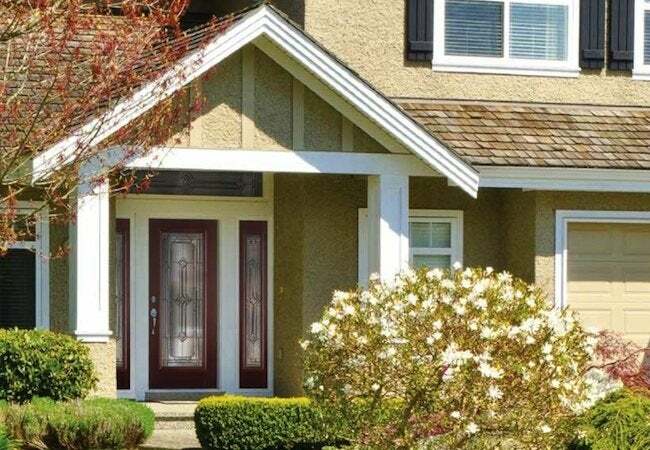 Besides the immediate boost to curb appeal, a new door can also bring enhanced security and even superior energy efficiency, assuming the previous installation, like many old doors, had become drafty over the years. There are a dizzying array of doors on the market today. To narrow the options, anyone wading into the ocean of options can do well by focusing their search on warranty-backed doors from long-established manufacturers. Masonite fulfills both criteria. In operation since 1925, the Tampa, Florida-based company offers steel, wood, and fiberglass doors in styles to suit any preference or spec. Best of all, some Masonite doors are guaranteed by warranties for up to 25 years. In fact, Masonite steel and fiberglass doors feature a limited lifetime warranty when purchased at The Home Depot, making the retail chain your best bet for value. Choosing a Masonite door can begin at The Home Depot, or it can begin online with Masonite Max. 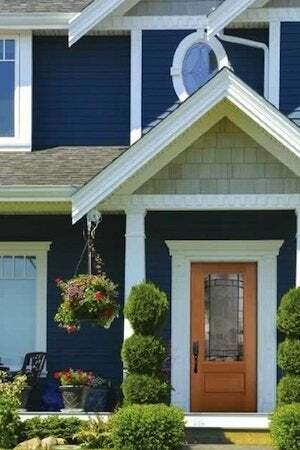 Offered jointly by The Home Depot and Masonite, the easy- and fun-to-use Web tool guides you through designing an entry door that perfectly matches both your practical needs and your aesthetic tastes. When you’re finished, Masonite Max provides the name and model number of your chosen product, making your purchase from The Home Depot fast and hassle-free. And if desired, you can even use Masonite Max to schedule an in-store appointment with a Home Depot customer service agent. He or she not only handles your checkout, but can also answer questions about working with Masonite doors. If you’re a contractor, then, perhaps better than anyone, you know the old adage is true: Time is money. What you may not know is that in addition to carrying the full suite of Masonite entry doors, The Home Depot offers many appealing conveniences and services especially for its professional customers. For starters, there’s the Pro App, which gives you up-to-the-minute info on what’s in and out of stock at your local store—definitely a time-saver. The Pro App also gives you electronic receipts, which you can quickly and easily forward to clients. That, too, saves you a step and frees up your time for other things. In addition, purchases of Masonite doors—or any other tools or materials—can be charged to a Revolving Charge Account, which makes bookkeeping as easy as it possibly can be. Once you’re set up, the account allows you to carry a balance, make low monthly payments, and enjoy itemized billing. Commercial Credit Accounts are yet another convenience for contractors at The Home Depot. These help small business owners by enabling them to issue cards to employees, track expenditures online, and set up PO numbers. You can go back to focusing on being a contractor, not an accountant! For high-quality doors in almost every imaginable style and material, with unparalleled support for those in the building trades, Masonite and The Home Depot are the doorway to value and satisfaction.